A few weeks ago CBS Sunday Morning presented a story that started in the Italian Alps of the Dolomites where a woodcutter with the name of Fabio Ognibene (Everygood) was seen wandering through a forest of alpine spruce while pointing out which attributes of various trees – ones with long and straight trunks and few branches or knots – were perfect for making violins. It seems Italian stringed-instrument craftsmen have been selecting spruce and other varieties of prepared wood from the Fiemme Valley for almost six centuries because the light and elastic mountain timber makes stringed instruments, including pianos, sound better. The alpine spruce at this elevation is chopped down in the fall during a waning moon when there is the least amount of sap in the tree. And then, after it is cut and cured, it goes to Cremona, Italy where the magic happens. Cremona in Lombardy ( about 90 minutes southeast of Milan by car) is famous for its luthiers – makers of stringed instruments – who have been crafting high-quality violins since the 16th century. Its beautiful medieval and Renaissance architecture and fabulous cuisine make it an excellent place to visit even in this cell phone world where Alexa and Siri have taken control of selecting the music for the masses; and if you, like me, are skeptical about the ultimate future of handcrafted violins and cellos. 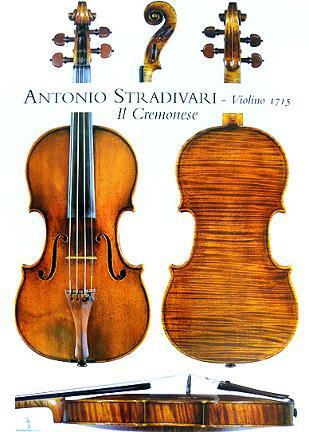 One of the first violin makers in Cremona was Andrea Amati (1505 – 1577), considered to be the inventor of the violin. The city’s most famous violin maker was the long–lived Antonio Stradivari (1644 – 1737), who produced more than one thousand musical instruments in the late 17th to early 18th centuries. Stradivarius violins continue to be regarded as the best in the world today. 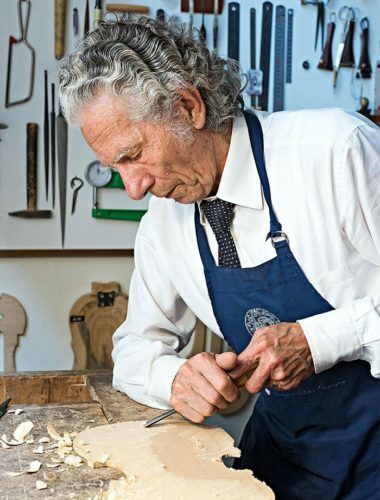 Cremona is still home to more than 140 luthiers in workshops located throughout the city, as well as a luthier school. A visitor only has to look for signs the say “LIUTAIO” to be able to observe craftsmen (very few women have been encourage to apprentice) at their work. In 2012, UNESCO decreed that traditional violin craftsmanship in Cremona deserved protection on its list of “Intangible Cultural Heritage of Humanity.” In 2013, the grand Museo del Violino opened in Piazza Marconi in the city center. The museum has excellent multi-media exhibits about the history and creation of stringed instruments, including the reproduction of an historic workshop. A large display of violins, made in various centuries, including Antonio Stradivari’s 1715 “Il Cremonese” violin and others by Guarneri and Amati. The collection also includes examples of the viola, cello, lute and double bass. The less high-tech Civic Museum Ala Ponzone-Stradivariano (Via Ugolani Dati 4), was dedicated in 1887 and the collection has been housed since 1928 in the 16th century Palazzo Affaitati. The original heart of the museum dates back to Marquis Sigismondo Ala Ponzone (1761 – 1842), who donated his private collection (paintings, archaeological artifacts, coins, and ornithology). The Museo Stradivariano was housed in the same location as a specialised and independent collection that includes artifacts and tools from the workshop of the maestro Antonio Stradivari, donated to the city of Cremona by the violin maker Giuseppe Fiorini. 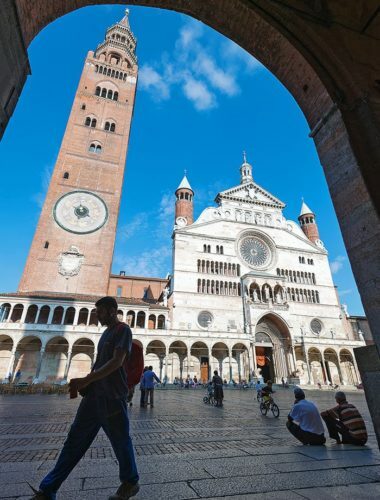 The Gothic palazzi, the Torrazzo (one of Europe’s tallest surviving medieval brick towers that houses one of the world’s largest astronomical clocks), the Romanesque cathedral, and the octagonal 12th-century baptistery, make a tour of the historic center an evocative experience. Mozart once performed in 270-year-old Teatro Ponchielli in Cermona and the theater is still hosting concerts in 2018. Go to Cremona this year between September 27 and October 14 for the 15th International “Triennale” Violin Making Competition Antonio Stradivari (XV Concorso Triennale Internazionale di Liuteria Antonio Stradivari), where modern luthiers worldwide compete in the “Olympics of Violin Craftsmanship.” Once the jury has completed its deliberations, the instruments will be exhibited to the public.